From its secluded beaches to its steamy rain forests, Belize is a country of diverse natural beauty. Its slow pace of life makes it a popular tourist destination, and cost of living is still low. For the more adventurous traveler, activities can include a trek into the jungle in search of Maya ruins, spotting parrots, toucans, and maybe even a jaguar along the way. It’s true that Belize is no longer the most affordable place to buy property, but this country has other benefits: economic stability, a stress-free lifestyle, and a cost of living that is good value when compared with the U.S. (or even other Caribbean destinations). It is still undeveloped and sparsely populated so there’s a lot of room (on the beaches, in the jungle, in the rain forests…) for you to stretch out, and there are only three highways traversing the country (one goes north, one goes south, one goes west). Tourism here is booming. A dozen years ago, the planes from Miami to Belize City were full of Belizeans returning home from their visits to the States. Today, they are full of Americans. We asked one reader why she was moving to Belize: “The simple answer is quality of life–we’re looking to improve ours. In Belize, we know our lives will be blissfully free from the commuter crush, 24-hour news, workaday stress…Belize is a land of few cars, abundant fresh food from the sea and the trees, and great natural beauty,” she said. What makes Belize such a popular destination? They speak English. If you don’t enjoy the idea of learning a new language but still want a place in the sun, then Belize is the place for you. If beachfront isn’t your first choice, maybe you would prefer being surrounded by the rain forest, mountains and rivers, or Maya ruins and caves. For this, the Cayo remains the unsettled (and affordable) frontier. And it’s our favorite part of Belize. 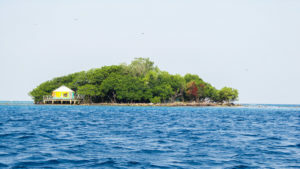 Though Belize has a top-flight offshore banking structure, beautiful landscapes, and an English-speaking population to recommend it, cheap property is not one of the attributes you’ll find here. Though prices for real estate have not changed much in the last two years, they are nevertheless higher than what you’ll find in Guatemala, Honduras, or Nicaragua, for instance. Property prices vary greatly in Belize from one area to another. They generally are highest in Belize City, on Ambergris Caye, and in Placencia, and lowest in remote rural areas. In large tracts, raw land is available in Belize for under $100 an acre, but access may be poor and surveying costs may exceed the cost of the land itself. Home prices range from under $15,000 for a simple Belizean-style home in a small village to $500,000 or more for a luxury home on the beach in San Pedro. Even with appreciation, real estate prices in Belize are still inexpensive by the standards of the U.S. or most of Western Europe. Belize’s government wants you to invest in the country. If this investment benefits the community, then your business may be eligible for significant tax relief for up to 20 years. Belize also offers one of the few remaining secure and private locations where you can protect your wealth with confidence. In an age when foreign governments are gaining access to accounts once thought to be sealed, the security and privacy Belize guarantees is certainly an advantage. Belize also has some of the region’s most lenient residency laws. You can declare permanent residency even if you only spend two weeks of the year in the country. When moving your household goods to Belize, you can start by choosing an American moving company, but that firm will still have to deal with a Belizean relocation firm for the final leg of the trip. Most experienced expats say the best strategy is to select the Belizean company first. This firm will then choose the American company that it wants to work with. When you fly to Belize, you’re allowed to bring in items for personal use and not for resale. These typically include clothing, medicines, toys, a laptop computer, books and up to four liters of hard liquor and/or wine. If you have any doubts about what you can bring, ask the airline, a Belizean relocation company or the Belizean Embassy in Washington.